GPKit Info - Get Ready For the Next Medical Emergency! gpkit is a complete, all-in-one emergency kit, for use in community settings. Airway patency is maintained with oropharyngeal airways (four sizes). A laryngeal mask airway, disposable laryngoscope, and endotracheal tubes may be ordered as supplementary items if prolonged ventilatory support is likely to be required. A 12 G Dwellcath should be used for emergency needle cricothyroidotomy in complete upper airway obstruction in children <10 years. An endotracheal tube (3.5mm) and connectors are used to maintain airway patency following incissional cricothyroidotomy for complete upper airway obstruction in children >10 years. Positive pressure ventilation is administered via the bag-mask resuscitator provided. Inhaled bronchodilators are delivered using the small volume spacer provided. This device is appropriate for use in children and adults. The 12 gauge dwellcath provided should be used for emergency decompression of a tension pneumothorax. Intravenous access is achieved with intravenous cannulae (18 –24 G). Interosseous needle placement can be achieved with the 18 gauge cannula provided. A T-design interosseous needle may be ordered as a supplementary item if required. Winged infusion sets are recommended for “in and out” intravenous access – eg: for the administration of drugs, but are not recommended for ongoing IV access. 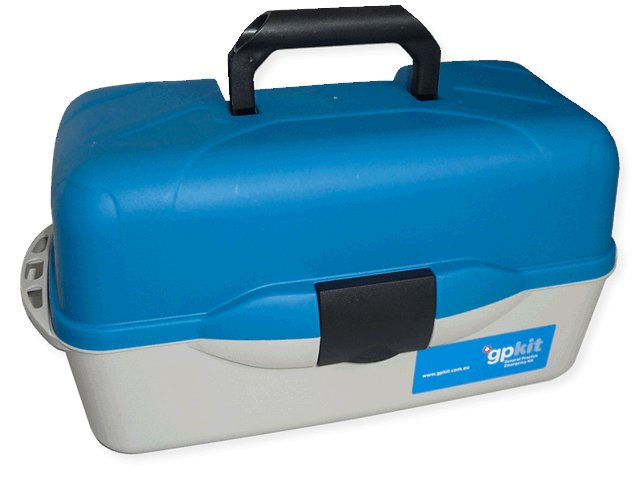 gpkit provides storage space for all PBS (Doctors Bag) emergency drugs. Always store drugs in the spaces provided. Generic “one size fits all” spaces permit flexibility between commercial preparations. Where carriage of S8 drugs is deemed essential, care must be taken to ensure storage complies with state and territory legislation. The gpkit case can be secured using an external lock if required or alternately S8 drugs may be stored in a separate locked container. Please note, reference should first be made to relevant state and territory legislation as some jurisdictions may prohibit storage in doctor’s emergency bag at all. Any use of S8 drugs must be recorded in the Schedule 8 Dangerous Drug Book provided. In special circumstances, such as Doctors working in remote rural areas additional equipment may be ordered on request. info@gpkit.com.au or call 02 8911 4818. This information is based on current evidence based management guidelines. It is intended to be a management guide only. While every effort has been made to ensure that information presented by gpkit is in accord with current evidence, no responsibility can be taken for the management of individual patients as this will vary with clinical circumstance. © gpkit 2009. All rights reserved.